Brexit – whilst there is certainly a lot of indecision about the whole process to date and that seems unlikely to abate anytime soon, there are issues that organizations need to consider when planning their future strategy, services and workforce. Although we must acknowledge that Brexit may lead to further challenges on Government expenditure which could drive the sector into an even deeper crisis, with this report we seek to provide you with some practical hints and tips for you to use in your organization to help you navigate through this changeable period. 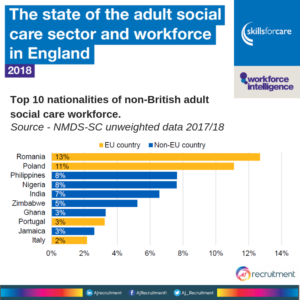 Our practical solutions to these critical workforce issues specifically look at how you can retain your existing EU nationals and how you can use recruitment partners strategically to increase your ability to recruit in the short term and to help meet your longer-term workforce planning requirements to ensure you have an adequate pool of skilled and caring staff in the future. What are the things you can start doing now to safeguard your current position through Brexit and help reassure your workforce? While already fighting a massive recruitment and employee retention crisis in this sector, Brexit is likely to impact this even further. 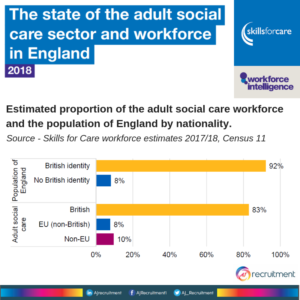 The state of the adult social care sector and workforce in England is a recent Skills for Care Report, which evidences that around 8% of EU nationals make up the social care workforce. To ensure that you don’t lose any of these critical individuals in your current workforce we advise that you communicate with these individuals promptly to ensure that they understand the settlement scheme and what this means for them. It is useful to know that the Head of the Civil Society for Engagement in the Department for exiting the EU has recently provided reassurances that all EU Nationals are still welcome in this country and that the current government is making sure these people can stay wherever possible. 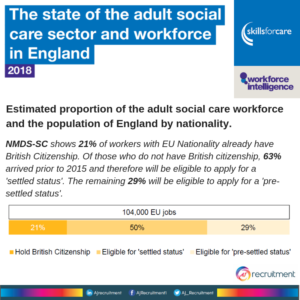 If somebody in your workforce has lived in the UK for 5 years or more, they will be entitled to apply for the “Settled Status”, according to NMDS-SC this includes around 63% of EU National workers in the social care workforce. To register for this, it is a one-off cost of £65. The government has said that they do not want any regression on peoples rights and the current framework will stay the same, e.g access to NHS. For those who haven’t been here for a full 5 years they can apply for a “Pre-settled Status” and when they have reached the 5-year marker EU workers can then apply for a “Settled Status” for FREE. 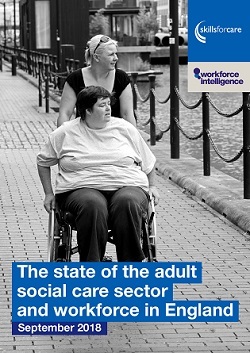 According to NMDS-SC, this includes around 29% of EU National Workers in the social care workforce. It is also worth considering paying the £65 for all your EU workers to register for a “Settled Status” to keep you from losing them when Britain leaves the EU. The NMDS-SC shows that around 21% of EU National workers already have a British Citizenship, these 21,500 workers will not have to apply for a settled status. There is a very broad list of documents that are required for anyone who wants to register for the settled status and once they have this they will come away with 1 digital document making the process transparent and simple. The Department has also communicated that they are very happy for organizations to get in contact with them to answer any specific questions you may have around this. However, to also help you stay up to date we advise that you register for updates on the Home Office Settlement Scheme. Planning ahead is critical in these uncertain times. While we cannot control what the final deal is and how this affects us as employers, we can take control of our own recruitment strategies and make sure we have a stable workforce and a backup plan if we do lose key members of our team. Map out your workforce, identify who is at risk of leaving and how many vacancies this could create in your team. Ensure you have the right recruitment plan in place to kick in should it be needed. We are happy to work with you on your recruitment plan to ensure this is defined and everyone knows what to do when someone leaves your organization. Choose a recruitment partner wisely. You are a specialist in running a social care service, but you may not have the time, expertise and tools needed in your team to recruit and stabalise your workforce. With over 15 years of Social Care recruitment experience, we are confident we have a solution for you. 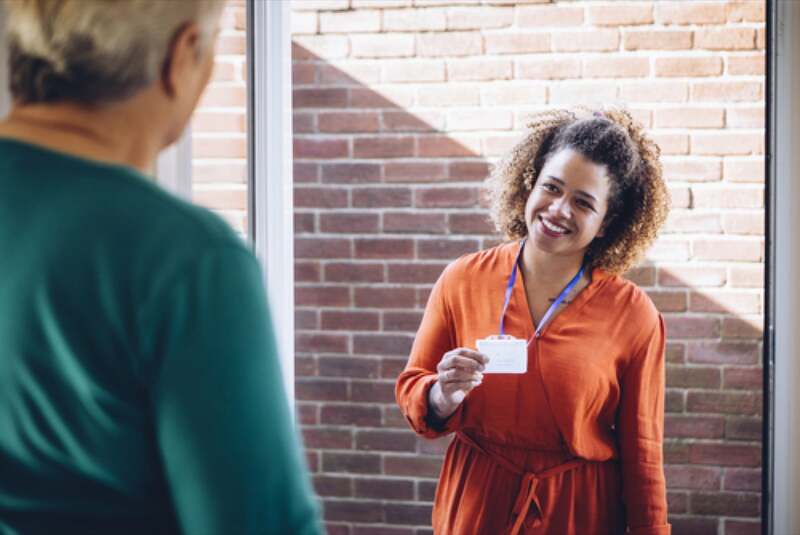 Whether it be temporary staff, Temp to Perm contracts or Permanent placements we will work with you to add value and ensure the people that use your service are not affected by any staffing issues. AJ Recruitment is proud to be our client’s first choice when using an agency for their staffing needs. We take all of the hassles out of recruitment, saving you the time and cost of searching for the perfect candidate. Given our sister company is a CQC registered care provider, we appreciate the value of excellent staff. Finding the person with the right qualities makes all the difference. Compliance and training are at the heart of what we do. Ongoing professional development is top of the agenda for our entire team of support workers. Training programs ensure up-to-date compliance with the latest legislation. Each member of our award-winning team is chosen for their comprehensive work history, reliable references as well as their outstanding personal qualities. We have to keep the pressure on Government to ensure the forthcoming Green Paper that was initially due to be published in summer 2017 that has already been delayed several times is kept at the forefront of Ministers minds. The Government has said that the proposals in the Green Paper will “ensure that the care and support system is sustainable in the long term”. During the General Election campaign, the Prime Minister said that the proposals in the Green Paper would include a lifetime “absolute limit” (i.e. cap) on what people pay for social care, and the Conservative Party’s manifesto also proposed changes to the means-test. The former Health and Social Care Secretary subsequently confirmed that a cap on lifetime social care charges would be introduced. Other topics that the Government have said will be included include integration with health and other services, carers, workforce, and technological developments, among others. The Government will also consider domestic and international comparisons as part of the preparation for the Green Paper. We have to make sure that such important issues are not forgotten amongst the current political disputes and that Social Care is put firmly back on the agenda. To do your bit and take action to ensure this doesn’t get forgotten by the Government, here’s what you can do. You personally can meet with your local MP, tell them how important it is to you and your organisation that it isn’t forgotten. Or better still, get your carers to meet with their local MP, get them to tell them why the Green Paper has to include support for carers and why it is so important to them. Getting your voice heard will help make sure the Green Paper isn’t forgotten and is at the forefront of the Governments minds. To make it as easy as possible for your carers if they want to meet with their MP, here is some useful info you could use: https://carers.org/meet-your-mp-about-social-care-green-paper-2018. 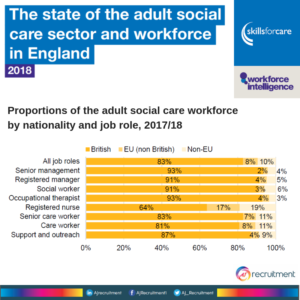 Social Care organizations are already experiencing EU Nationals already making the decisions to move back due to the uncertainty that Brexit brings. We hope you can use this guidance to help reassure and steer your workforce in a more positive direction during this challenging time.